When Splendid hired 23 Stories to create an ad campaign for their capsule collection with Margherita Missoni, they Also wanted a launch event that Brought the the unique aesthetic of their collaboration to life. The Conde owned agency turned to The Gate to design the project. The Concept: Margherita Missoni lives the effortless glam lifestyle that her collection with Splendid captures. To showcase this The Gate conceived of oversized living mood boards populated with inspiration, objects and images taken straight from Margherita’s instagram and lifestyle. The Result: For the launch event we transformed The Public Garden into “Martherita’s World” including eclectic textiles, displays and of course, the living walls. Later, the event design was recreated and expanded in the Splendid showroom. The event resulted in the clothing brand more than doubling its showroom appointments with buyers and received media coverage in The LA Times, The Cut, WWD and Vogue. 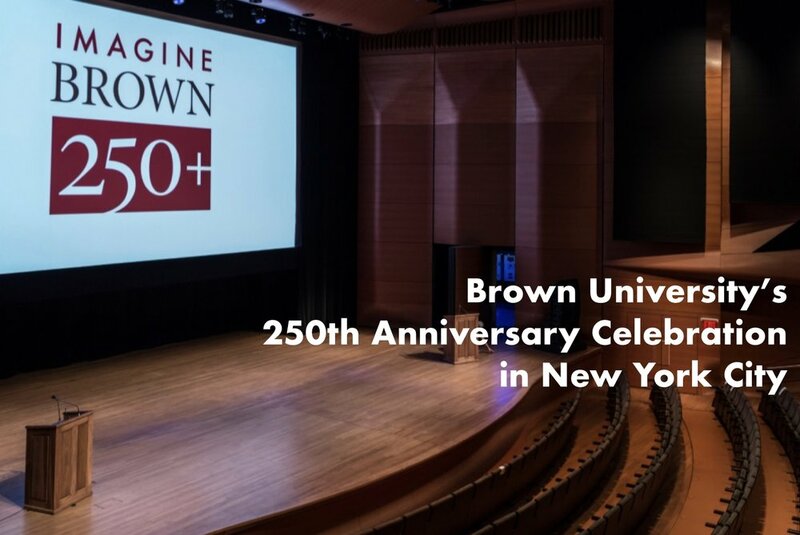 To celebrate the university’s 250th anniversary and introduce University President Chris Paxson’s new Strategic Plan, Brown wanted to “make a splash” in it’s largest market: New York City. The Concept: To engage the multi-generational, multi-cultural audience, The Gate conceived of an evening entitled Brown on Stage and Screen to be held at Lincoln Center. The Execution: The multi-media program included a staged set of monologues written by famous alumni writers. Alumni actors were recruited to perform the pieces and the “set” consisted of projected vintage Campus postcards. A short film by Betsy West about the University’s legacy of engaged learning was screened and finally the President introduced her plan to take the University into the next 250+ years. At the pre- and post-reception, aspects of campus traditions added a layer of nostalgia to the event. Upon arrival, The Brown Band welcomed guests outside of Lincoln Center, while the lobby was transformed to mimic the look and feel of Campus Dance, the schools most beloved Commencement/Reunion tradition. Microsoft has an expansive portfolio of brands, each of which has done well individually, but have struggled to harness overarching brand power for Microsoft. The tech giant sought to re-introduce themselves to the media to showcase themselves as more of a lifestyle brand vs. a workplace necessity. The Concept: Our goal was to message Microsoft products as a brand that integrated into all the “soft spots” of your life in a space that would remain active over a period of days. The Execution: The result was a “Living Museum” inspired by the Museum of Natural History that showcased major life milestones and Microsoft technology. Through mannequins and an astute tech team we were able to bring moments like wedding dress shopping and debuting your first born to life for several days while the marketing and PR teams were trained in how to best pitch and position the brand. 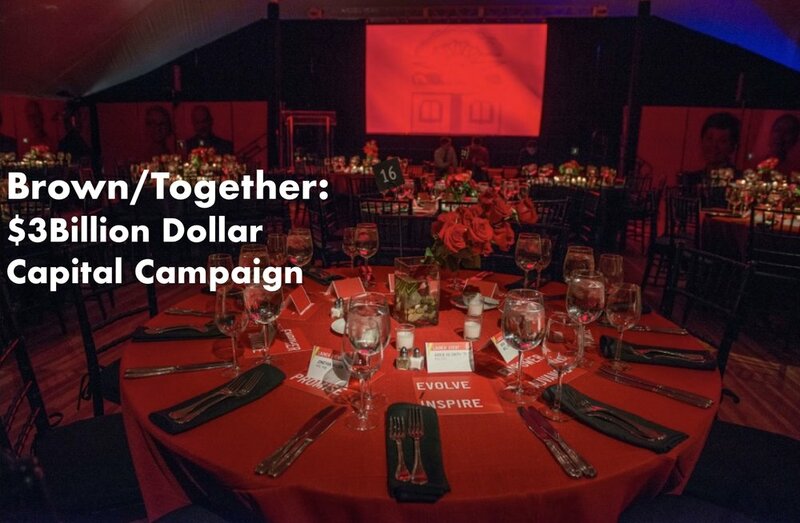 When Brown’s Board of Trustees decided to launch the Brown/Together capital campaign-the University’s most ambitious to date-the University tapped The Gate to design a unique launch event that reflected the visual identity for the campaign and that could travel globally to major alumni hubs. The Concept: An evaluation of the alumni audience found that alumni most valued their rigorous intellectual experience while at Brown. With that in mind we decided that the Launch event needed to provide the audience with intellectual meat to chew on, and that content should be shaped around our main priority areas for fundraising. The Execution: The resulting concept was a “Festival of Ideas”. 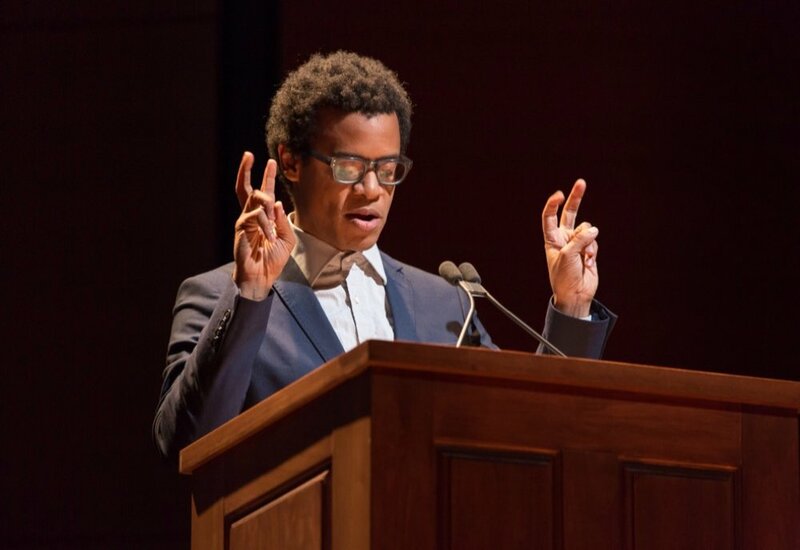 As a pre-amble to a dinner program and campaign announcement, guests were able to attend a series of mini-lectures by Brown faculty. The subjects were organized thematically around fundraising areas. The decor & and concept were designed to be modular and taken on the “road” for regional kick off events. The Follow Up: Based on the success of this event, The Gate was then brought in to re-fresh and re-assess more of the over-all programming produced Advancement around the Campaign. As part of an ongoing consulting relationship, we have worked with their in-house events team to streamline programming and branding efforts to maximize the impact of event-spending dollars. Our work with the advancement team has resulted in new evaluation and approval processes for events from concept to execution. Additionally we have developed a campaign event brand book for their team to work with through the duration of the campaign to ensure visual brand consistency. Finally, we worked to develop guidelines and visual identities for ongoing Donor Recognition programming. 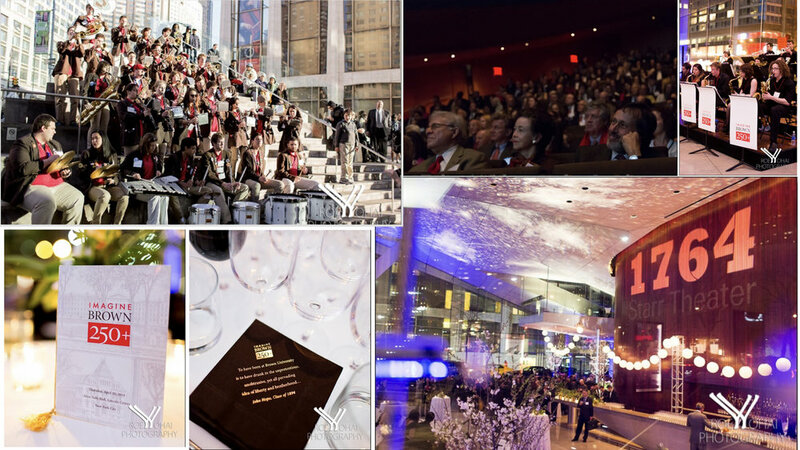 XO Group’s flagship brand, The Knot, hosts an annual Gala for advertisers. 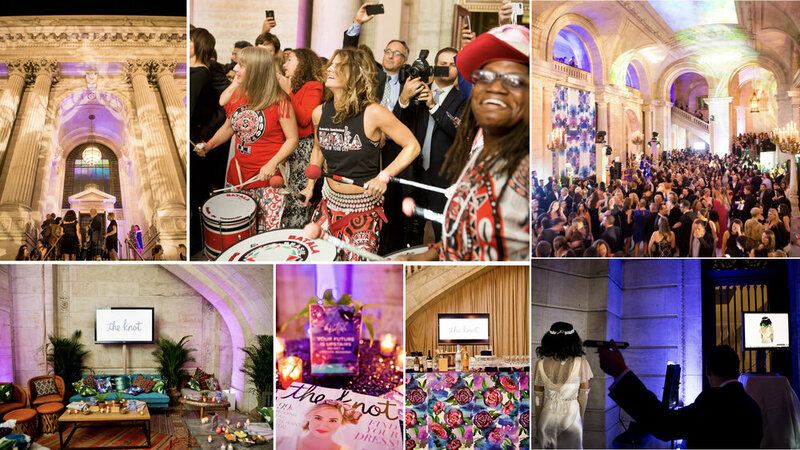 For their 9th Annual Gala, The Gate was tasked with refreshing the event by emphasizing their place as a cutting edge tech platform vs. a bridal media brand. The Concept: The Gate conceived of a design that integrated new event and design technologies including new partnerships with tech brands such as Spoonflower and Apple. The Result: To maximize the FOMO-potential for non-advertisers, our design featured as over two dozen instagramable moments, including video projections and surprise performances to capitalize on the new popularity of Snapchat and Instagram stories. Additionally we created a social media strategy with our brand partners to build interest leading up to The Gala. The result was an unprecedentedly long wait list of advertisers and potential advertisers seeking tickets and 50% more traction on social media than the previous year.